Audrey has a loose tooth. A very, very loose tooth -- like any day that sucker's gonna come right out loose. And it's her first one. So I had to get the very clever, incredibly cool Official Tooth Fairy Kit, no? It's even more perfect in person. Can't wait to use it -- I'll keep you posted! Very cute dress! Love the floral pattern. pretty dress, lovely the style of it! the tooth fairy kit is way cute!!! Gorgeous dress and just love the tooth fairy kit :-)) So lovely! 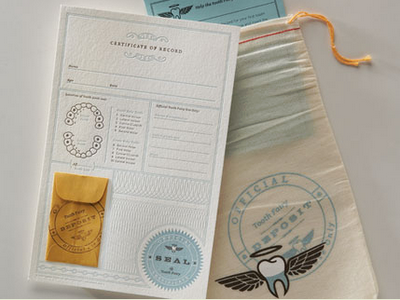 The tooth fairy kit is simply adorable! I want one for my little man's first loose tooth. which hopefully doesn't happen for a long time...Thanks so much for sharing! damn. my toothfaity bags have kindof been put on the back burner. maybe by her next tooth. Will she pull it? twist, washcloth, twist! fun. I saw this Tooth Fairy Kit and thought it was the sweetest thing --- let us know how it goes! Oh I can't wait for the tooth fairy phase! That dress is the sweetest. beautiful. and um...tooth fairy kit? are you serious?? could you get any cooler!?! I think that tooth fairy kit is one of the cuter items I have ever seen! And that dress is definitely adorable--perfect for summer! gorgeous print on the dress and the tooth fairy kit is a hoot! love the tooth fairy kit....so cool! I have to get this kit! my daughter is getting ready to lose her first and I'm trying to come up with a sweet, tiny box for under the pillow. I'm not sure which one I'm more smitten with: the dress or the kit! I am entirely smitten with this sweet (and official!) kit. i love the dress and i love the kit! how clever indeed!